Are you a patient or family member who has experienced what it is like to go from the adult Intensive Care Unit to the Ward of a hospital? 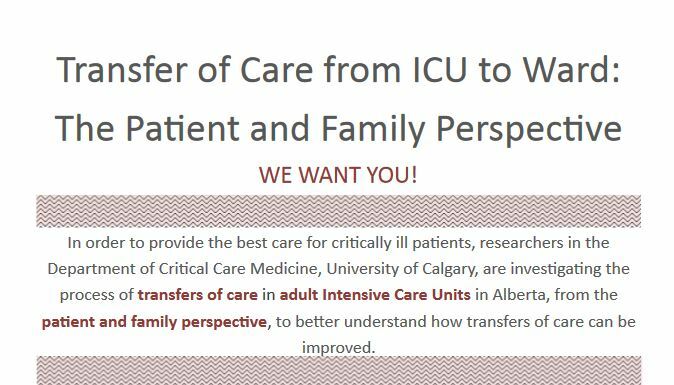 If so, the Department of Critical Care Medicine at the University of Calgary is inviting you to join in a facilitated session to discuss the transfer of care process. This session will be held on November 2, 2017; 10:00 a.m. to 3:00 p.m. in Room TRW2D39; Teaching, Research and Wellness Building, Foothills Campus, University of Calgary; Calgary, Alberta. Click here to read more. This entry was posted in Announcement, Family Advisor, Family Presence, Patient, Patient advisors, Patient/Family Experience, Research, Research Participants and tagged family experience, healthcare, ICU, patient experience, transfer of care, ward. Bookmark the permalink. ← Are You Dancing With Your Healthcare Provider?